One of the dishes I would like to perfect is a soufflé. It’s a versatile dish that can be adapted for any meal and can easily be a side dish or a main course. Plus, I love custard, and a soufflé is a close relative to custard. I really wanted to make a sweet corn soufflé for Thanksgiving. I wanted to use a combination of John Cope’s dried toasted sweet corn and delicious frozen sweet corn from my dad’s garden. 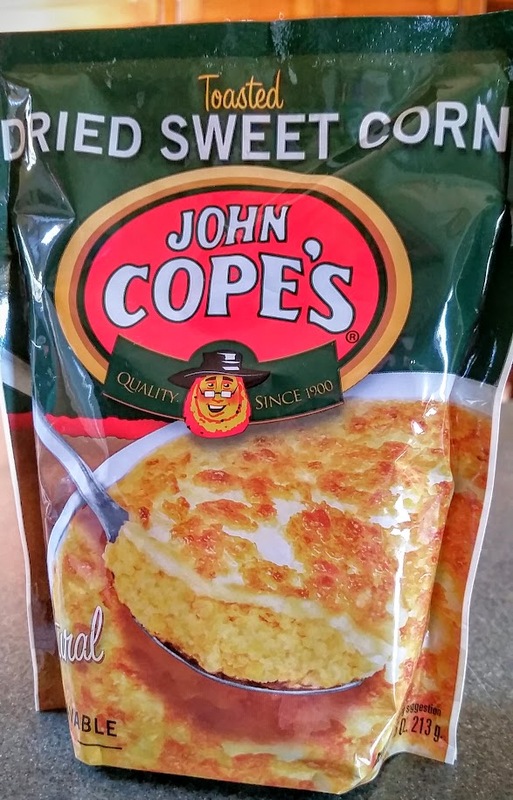 The recipe for “Baked Corn Supreme” on the back of the pouch of Cope’s corn seemed like a good starting point. You can see the picture of this dish on the front of the package. It basically makes a corn casserole, which is good, but I wanted to make it into a fluffy soufflé. I also wanted to use some of the super sweet garden corn frozen at its peak to add a blast of fresh corn flavor. Not to get too geeky on sweet corn, but a few facts on corn variety are good to know when you select sweet corn. When I get corn at the farmer’s market, I always ask for the variety. If they don’t know, I move along to the next stand. The variety my dad grew is called Bodacious. Bodacious is a yellow-kernelled se type sweet corn. The “se” type means it is a sugary enhanced variety. Bodacious is also a homozygous type corn, meaning both of its parent varieties are also se type corn, this is also sometimes designated as an SE (in capital letters) type corn. SE corn has about four times the sugar to starch ratio of old time su type corn (like the Silver Queen that was the most common type when I was a kid). SE corn will also remain very sweet for up to four days if it is kept refrigerated. Of course, we do not play that game and blanch and freeze our corn within hours of picking. This frozen corn will put the taste of summer on your table at any time of year. Now, how to make that soufflé? I looked on line for other corn soufflé recipes. Not a single recipe was for what I would call a soufflé. I already had an idea of what I wanted to do, so I have to admit my search was not too exhaustive. Place the dried corn in a food processor or blender. Pulse a few times to pulverize the corn. Place the dried corn, the frozen corn, milk, salt, pepper, and butter in a small pan and heat until corn is thawed and mixture is simmering. Beat the egg yolks in a bowl. Ladle a cup at a time of the hot mixture into the yolks and stir to mix. Add about 3 cups total of the hot mixture. This tempers the yolks to keep them from turning into scrambled eggs. While stirring the pot, add the egg yolk mixture into the pot in a thin stream. Heat the pot, stirring constantly, until the mixture thickens enough to coat a spoon. You can get to this point up to a day or two ahead of cooking. Chill the mixture in the refrigerator. Whisk the egg whites until they have stiff peaks. Fold the egg whites into the chilled corn mixture. Butter a two-quart soufflé pan. I created a collar by buttering a piece of non-stick foil which extended about six inches above the rim of the pan. I had no idea how high the soufflé would rise, and it ended up pretty tall, so the collar is a must. Bake at 375F for an hour. If the soufflé appears to be soft inside after an hour, or if it’s not browned on top, give it some more time to finish. 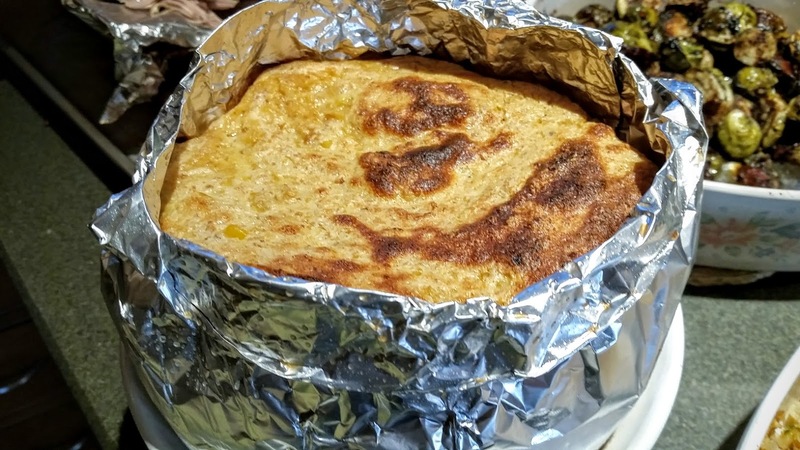 This soufflé could be enhanced with some grated cheese, or turned into a main course with an addition of some chopped shrimp or crawfish and a little garlic, onion and peppers. 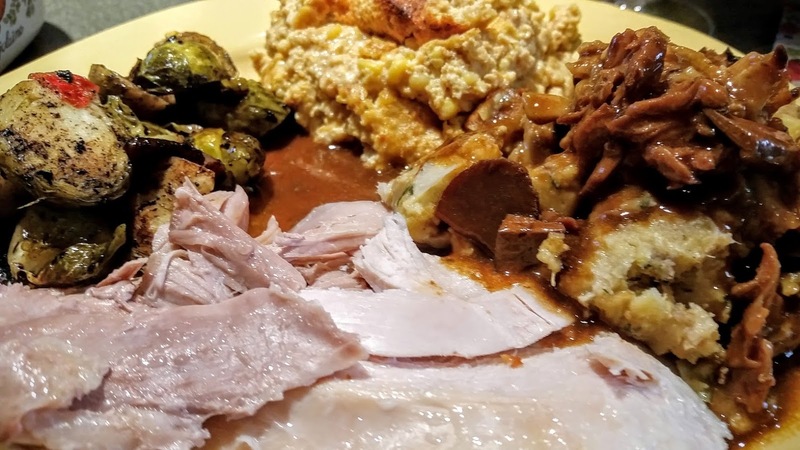 As it is, it made a very nice Thanksgiving side dish.